We perform all smog checks required by the DMV, including diesel, Hybrid & CNG vehicles. Our top quality service is guaranteed by our ASE Master Technician (17 years smog experience!). 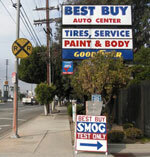 Best Buy Smog test only is located in Gardena near the Torrance Walmart. We also serve Redondo Beach, Hermosa Beach, Lawndale, Lomita, Hawthorne, Rancho PV, Carson, and South Bay. We're conveniently located off of the 405-FWY at Normandie Ave, near the Torrance Walmart. Experience: Many years of smog experience! Coupon: Check Out Coupon Page.